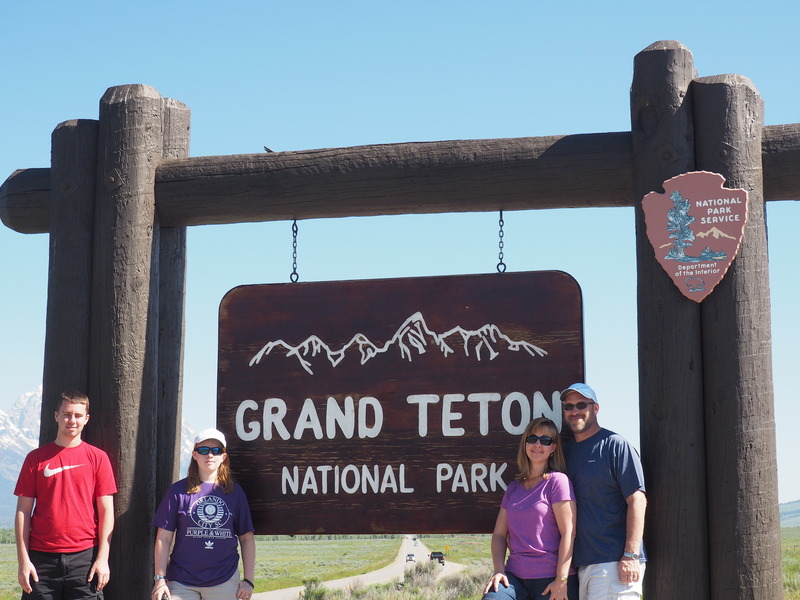 We got up early for our first full day of our western vacation, determined to make the most of our only full day in Jackson/Grand Teton National Park. We headed to the park, planning to take advantage of the paved loop roads that create a scenic drive through the park. Before I go any further, I have to say that we all loved, loved, loved this area and the park – highly recommend a visit here if you’re anywhere in the area. Surprisingly unperturbed at the cars pulling over to snap a picture. Signs abound warning drivers to watch for wildlife on the road and at first, I was nervous that some rogue elk or moose would burst out of the woods next to the road and surprise us. That quickly turned into “when are we going to see some wildlife here?” since there was nary an elk, bison, or moose in sight, much less a rogue one. 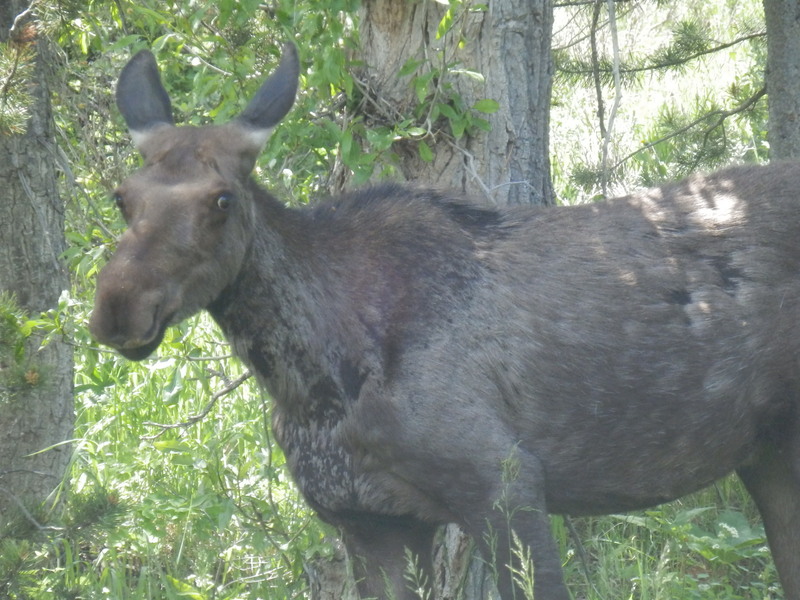 Our first sighting was halfway through the day when we spotted this moose, placidly chomping away just a few feet from the road inside the park. We stopped off at Jackson Lake Lodge, built in 1955 and listed on the national register of historic places. The lobby area offered spectacular views of the mountains from 3 floor-to-ceiling windows. Speaking of the mountains, the Tetons were the most unique we’ve seen. They rise almost vertically from a fault line that runs at the base on the mountains, which means that there aren’t really any foothills. On the other side of the fault line is Jackson Hole, a valley of sorts ringed by the Tetons on one side and the Gros Ventre Range on the other. It’s hard to describe how different the mountains look rising fully formed without the hesitant fits and starts of foothills. It’s almost as if you can drive right up to the foot of the mountain, which we came pretty close to doing. We also caught a nice view of the Teton glacier, an seemingly unassuming white patch neslted in the crook of the mountains. 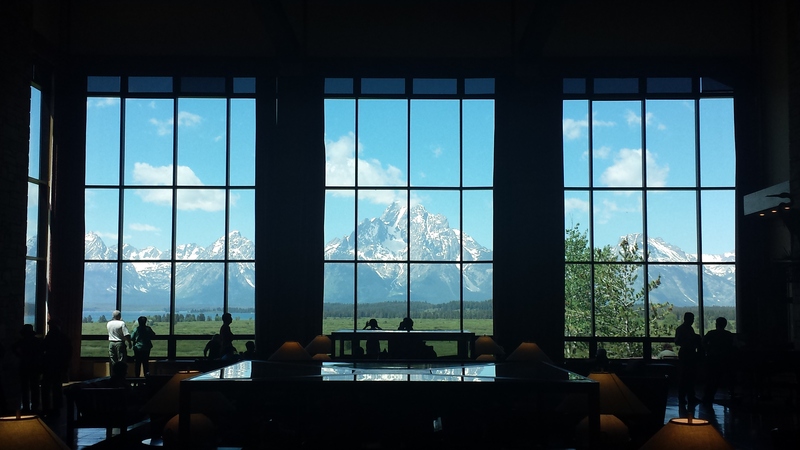 While taking in the view at the lodge, I overheard a conversation about a few people recently getting caught in an avalanche on Mount Moran near the glacier, one of whom didn’t survive. Sure puts that view into perspective. 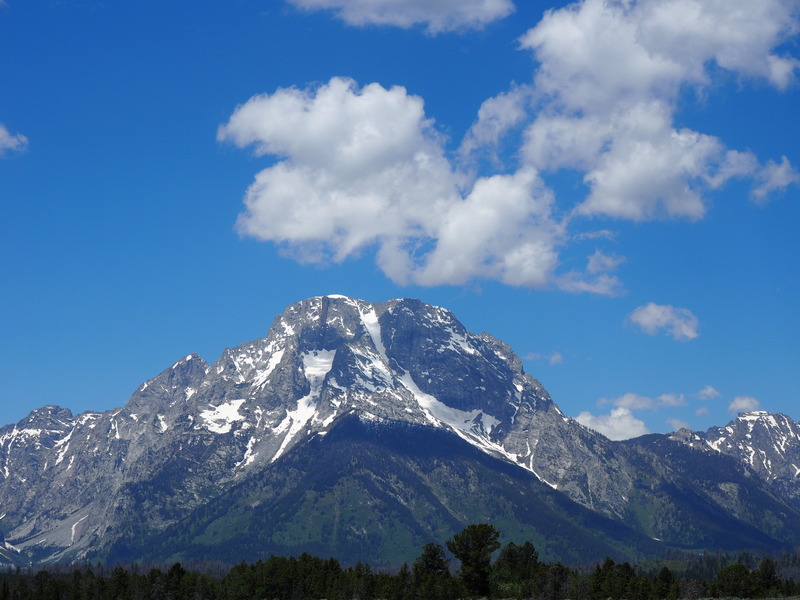 Speaking of Mount Moran, here it is. We left the lodge and toured more of the park, then stopped off at Jenny Lake, a popular camping and recreation spot. There were several swimmers and kayakers in the lake, but I’m sure that water was just a few degrees too cold for me! 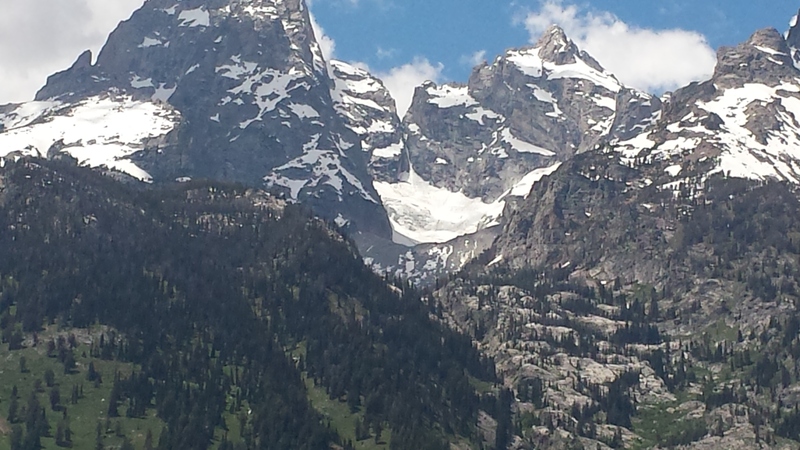 Our last stop was Teton Village, a ski resort. We took a gondola ride to the top of the mountain, where we had spectacular views of Jackson Hole and Teton Village. Fortunately, we grabbed our jackets before we headed up since it was significantly cooler at an elevation of 10,450 feet. In places, the wind whipped around the mountains and brought some wicked wind chill with it, making me glad to have at least a hoodie to ward off the cold. I did wonder how the people getting off the gondola in nothing more than shorts and tanks tops would fare but perhaps they are made of more cold-resistant stuff than I. Since we live in a subtropical climate, it was a novel experience for all of us to have a snowball fight (icy snow, but snow nonetheless) in the middle of June. Majestic views, hard to capture in a single photo. I love this shot just for the sense of scale that it gives me. Me and my kids on top of the world! Top o’ the World selfie! An awesome view as far as the panoramic lens can see. Man, that wind chill was pretty harsh for this Florida girl. We wrapped up our Jackson experience by spending an evening in town. We watched a kitschy but entertaining re-enactment of a Wild West shootout in the town square, enjoyed bison burgers for dinner (well, at least the two adults did), and strolled around. 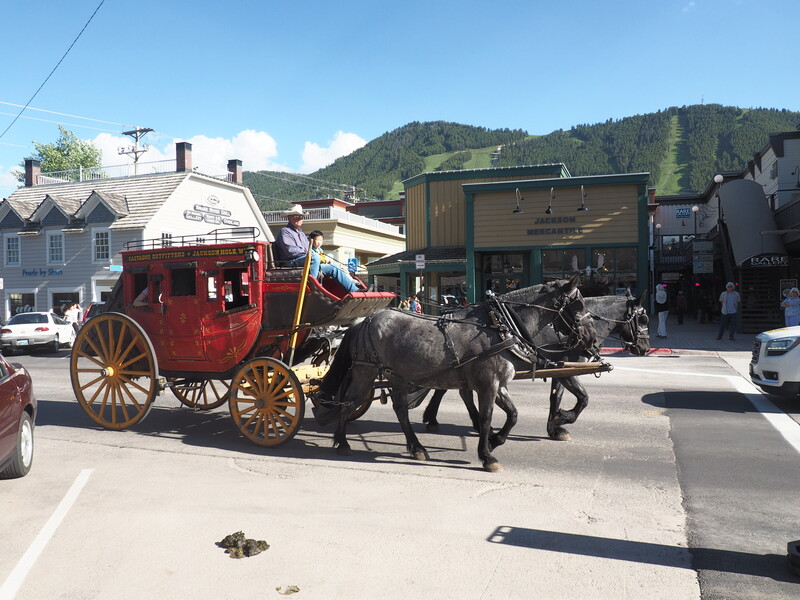 It’s a charming town, with restaurants, art galleries, bars, and of course, stagecoach rides. Speaking of the stagecoach, I can’t remember the last time I saw so many people almost get hit by cars as I did while eating dinner on a balcony overlooking the square. Seems that just the sight of a stagecoach was enough to make people forget that there are cars on the roads as they backed into the street to take pictures. I imagine a few of the locals are sorely tempted to bump a tourist here and there out of frustration. What’s up with those antler arches anyway? My daughter took this shot – I liked how she framed the mountains with the evergreen. Now here’s something I don’t see in my local grocery store at home.